NEW YORK, Jan 25, 2010 / — Since its release in 1980, the Rubik’s Cube has since found its way into over 350 million homes worldwide and has continued to fascinate, bewilder and challenge millions of people. As the Rubik’s Cube, one of the most beloved and best-selling puzzles of all time, celebrates its 30th Anniversary this year, the next generation of fans are cracking the code to this three-decade old icon. With the help of the new You CAN Do The Rubik’s Cube initiative, thousands of youths from schools, camps and after-school programs nationwide are accomplishing the unthinkable — solving the cube one fun twist at a time, while learning about algebra, geometry, and determination. And now, anyone, including parents, teachers, and students alike, can ring in the New Year by making their own “Rubik’s Resolution,” a pledge to learn how to solve the cube, gaining critical thinking skills and a sense of triumph along the way. Thirty years after its introduction to America by Erno Rubik, the Rubik’s Cube today is being used to teach important math concepts including area, perimeter, volume, angles, algorithms and enumeration, among many other geometry and algebra topics. To date, the You CAN Do The Rubik’s Cube program is used as an education tool and confidence booster in thousands of schools K-12 in 48 states across the U.S. and in over 100 Boys & Girls Clubs of America and YMCA after-school programs. With the launch of the new You CAN Do The Rubik’s Cube “Competition Guide,” dozens of schools have hosted regional competitions as well. 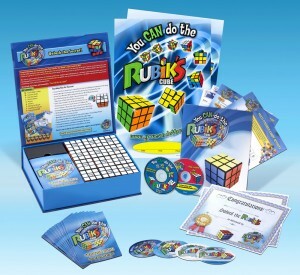 The “You CAN Do The Rubik’s Cube” solution kits available to schools, camps, and after-school programs include 12 Rubik’s Cubes, 12 solution guides, an instructional DVD, cube sign-out sheets, posters, stickers, and award certificates for when a child solves the puzzle.